The Tories gather in Manchester this week, with the economy, Europe, and more Europe set to dominate, reports Left Foot Forward’s Shamik Das. 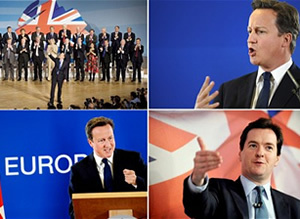 • The Tories gather in Manchester this week, with the economy, Europe, and more Europe set to dominate. “The eurozone is a threat not just to itself but a threat to the British economy and to the worldwide economy… The logic of the single currency is it leads you [towards fiscal union]. For more on the eurozone crisis, see Ben Fox’s article for us earlier this week. On the question of the faltering UK economy, meanwhile, the chair of the Treasury select committee, Tory backbencher Andrew Tyrie, warned last night the government did not have a “coherent and credible” plan for growth. George Osborne, who will deliver the key note tomorrow (arguably more important this year than the prime minister’s address), is expected to say unspent central government money will be injected into capital projects to kickstart the economy, a welcome boost in addition to Danny Alexander’s announcement to Lib Dem conference a fortnight ago of a £500 million capital spending surge. Today, the chancellor announced new enterprise zones are to be set up to help tackle the problems caused by BAe’s plan to axe 3,000 jobs, job losses described by Unite Assistant General Secretary Tony Burke on Left Foot Forward on Friday as a “serious disaster” that shows the coalition’s manufacturing policy has been “shot to pieces”. Mr Osborne’s predecessor Alistair Darling, meanwhile, told the Independent on Sunday this morning the government will change course on the economy. He said the chancellor “is not daft”, and will have already realised his austerity drive had “choked off” growth. “Deficits have to be brought down but the rate at which you do that affects growth. Without growth, deficits will rise not fall. We are already seeing that. That’s why George Osborne will change course. He won’t admit it, or call it Plan B. But he knows, because he’s not daft, that what growth there was has been choked off. Left Foot Forward will have reaction to the Tory conference all this week. • The calls for a Plan B grow ever louder, turning up the pressure on the government to act. “It is true that we do not have much room for a new fiscal stimulus. But that does not mean that we cannot do more to promote growth. First, those who have fiscal space available must explore it – but in a sustainable way; second, all member states need to promote structural reforms. To ram home the point of how dire the current situation is, Friday saw the worst quarterly fall in the FTSE’s value for nine years, down 13.7 per cent since the start of July; Paris’s CAC 40 slumped 25.1%, Frankfurt’s DAX dropped 25.4%, and the Dow Jones fell 11%. Also on Friday, Goldman Sachs warned the global economy is heading into a “Great Stagnation”, during which we would experience long periods of sluggish growth of about 0.5%, low inflation, rising and sticky unemployment, stagnant house prices, and lower returns on shares. Their economists calculate there is a 40% chance of this happening. Further proof of the pressing need for the government to put aside dogma, follow the evidence and change their minds on Plan B before it’s too late. • The Labour party met in Liverpool last week, with Ed Miliband stamping his vision on the party in an adequately scripted if poorly delivered oration. “How the speech goes down with tomorrow’s press awaits to be seen, and will be mulled over for many hours in the bars of Liverpool, but Miliband, who declared himself to be his own man, has a clear agenda – of fairness, of responsibility across the social and political spectrum and of a need to stand up for those in the middle, struggling to make ends meet. “If you are part of the Tory party, however, it appears you were watching an entirely different speech to most of the country, in which Miliband announced he wanted to ban business, nationalise everything, and eat the rich. “There’s room for improvement, but rhetorically, Ed Miliband’s party conference speech was better than many of his previous speeches. “Party conference speeches are especially hard to write because as well as all the usual requirements of a speech like tone, pacing, and imagery, you also have to address all the issues so that nobody feels left out. Hardest of all, you also have to formulate and articulate a ‘big argument’ for why you are doing everything you are doing. “All in all, there will always be room for improvement, but it was a good speech. It spoke to the public and the party. It contained a big argument. It painted pictures. It used analogies to make tricky arguments. The day after his big speech, Miliband took part in a Q&A session with conference delegates and opened the doors to non-Labour members of the public, a forum he appears to prefer, and one in which he was universally accepted to have performed better. He was quizzed by disabled blogger and activist Kaliya Franklin, founder of the non-partisan “The Broken of Britain” campaign, on disability reforms, an issue previously un-raised at the conference – read our report and watch the video. Finally, back to the economy, and in his speech to conference on Monday, Ed Balls called for growth now and cuts later, a speech described by Cormac Hollingsworth on Left Foot Forward as giving Labour “a solid economic foundation”. Ninety-six-year-old veteran of the Battle of Cable Street Max Levitas, who today spoke at the 75th anniversary rally and march to commemorate the day Londoners stood up to Oswald Mosley’s black-shirted fascists and sent them packing. He recalled how, in October 1936, every entrance to the East End was blockaded, while Irish dockers and Jewish tailors built three barricades across Cable Street to prevent an invasion by 3,000 uniformed fascists. An estimated 300,000 anti-fascist demonstrators turned out. Mr Levitas was joined today by representatives from Bengali and Jewish organisations, trade union leaders and local political figures. They urged marchers to celebrate the spirit of Cable Street by campaigning together to send a powerful message of unity against all who sow division and hatred in Britain today. London Mayor Boris Johnson, a man never far from the headlines, who this week was revealed to have broken his pledge to donate a fraction of the £250,000 annual fee he receives for writing his Telegraph column – a fee described as “chicken feed” by the Bullingdon boy. “…donated only a total of £20,000 over three years (compared to the £75,000 pledged) to fund six bursaries for a sports journalism course at the College of Communications, with another final sum of £10,000 expected. “He has also not given ‘nearly as much’ as £75,000 to a new charity set up by Friends of Classics to support Latin and Greek teaching in state schools. “Boris has given a tidy sum but it appears a long way short of what was publicly promised in return for resuming his column. There is also no future commitment for his second term, should he win. Earlier this week at the Labour party conference, Ken Livingstone outlined his key policies if elected next year, while Harriet Harman slammed Johnson for being “so removed from people’s lives”, standing for “higher fares for Londoners and lower taxes for bankers”, and being “in it for himself”. The Resolution Foundation’s “Low Pay Britain” report (pdf), published this morning, which coincides with yesterday’s 15p rise in the minimum wage from £5.93 to £6.08. An improvement, for sure, but the report reveals there are still five million workers – 20 per cent of all employees – still earning less than the living wage, which is designed to provide a ‘minimum acceptable quality of life’. “Low wage workers are more likely to be female, part-time and in the private sector. They are also more likely to be younger, though this is in part due to the traditional trajectory of earnings over the life course. Low wage workers are more likely to be found outside of London and the South East although in absolute terms, the South East, the North West and London all have more than half a million people earning less than the Living wage. We will have more on the report on Left Foot Forward tomorrow. Much of the recent news outside the United Kingdom has focused on the death of senior al-Qaeda figure Anwar Al-Awlaki at the hands of American forces. The death of Al-Awlaki, who was killed by a drone strike in the volatile country of Yemen, is seen as another public victory for the Obama administration in the war on terror. Although seen mainly as an ideological leader as opposed to a direct organiser within al-Qaeda, it will still be a bitter blow for a movement reeling from the death of Osama Bin Laden. Additionally, al-Qaeda made the news following an unlikely spat with outspoken Iranian President Mahmoud Ahmadinejad, whom they accuse of ‘spreading conspiracy theories’ about 9/11. ‘Inspire’, an al-Qaeda-linked online magazine, argued that despite Iran using the theories as a rallying call against America, the nation was “a collaborator with the US when it suits it”. Meanwhile, outside of the world of Iranian conspiracy theories, American foreign policy has been under scrutiny concerning their multi-billion dollar support for Pakistan. With much of the news media focusing on the ‘Haqqani’ militant group and their links with the Pakistani intelligence service, Pakistan has been urged to do more to combat extremism in its own ranks. Tensions rose last week after the most senior US military officer Admiral Mike Mullen described the Haqqanis as a “veritable arm’ of Pakistan’s spy agency, while the BBC reports a senior Haqqani leader, Haji Mali Khan, has been captured by Afghan and coalition forces. This week also marked a big step forward for Saudi women, who were given the right to vote from 2015. Furthermore they will be allowed the right to sit on the Shura council, an advisory body of appointed members. Women are still not allowed to drive cars or leave the country without the permission of a male relative, so despite being an important progressive step, there is still a long way to go in Saudi Arabia. In slightly less positive news, five decomposing heads have been discovered in a sack outside a primary school in Acapulco. The resort city has been the scene of a bitter battle as drug gangs fight for control. Whilst the Mexican government is engaged in a crackdown on the cartels it is still a massive issue in the country to the point where concerns are being raised in the US about the spread of the crime wave over the border into southern states. Despite a lot of comments on foreign policy in the last week the American political agenda has been shaped by one man in the past week, Republican Governor Chris Christie. As previous frontrunner, Texas Governor Rick Perry, falls back into second in the latest Fox News Poll behind the more moderate Mitt Romney, many Tea Party backers and social conservatives are looking for a strong alternative to the former Massachusetts Governor. The flavour of the week is former Godfathers Pizza CEO Herman Cain, who, having crushed his opposition in the Florida straw poll, is now polling third in the FOX poll on 17%, just 3% behind Perry and 6% behind Romney. Perry’s slump is seen mainly due to a series of poor, bumbling debate performances in contrast to the competent Romney or the charismatic Cain. Cain himself has come under scrutiny in the past week for arguing African-Americans have been ‘brainwashed’ into voting so strongly for the Democratic party. Following Christie’s seeming refusal to jump into the race it remains to be seen whether any serious Tea Party candidate will decide to compete, whether Cain will keep his momentum, and if Perry can make a comeback. The Obama campaign will be watching the Republican primary closely but will also be concerned by the President’s dismal approval rating in the latest Gallup daily tracking poll. With just 39% approving and 52% disapproving, recent polling in a contest with Mitt Romney is making depressing reading for Obama supporters across the pond. However, with the GOP primary being as unpredictable as it is they will be hoping a far-right candidate makes the currently unpopular President the lesser of two evils. As Labour formally approved plans to beef up the role of its leader in Scotland and Iain Gray delivered his final speech to the party’s annual gathering as leader, there were a plethora of warnings about the state of the party north of the border and the extent of the challenges it needs to confront. “The Labour party in Scotland has been scarred by internal disputes, some going back to disagreements about devolution. These might have been overcome under a powerful leader, capable of knocking heads together and driving the party forward, but Scottish Labour has suffered from a semi-permanent leadership crisis since the death of Donald Dewar in 2000. Elsewhere, there were warnings over the state of morale amongst Scottish nurses as new survey data found just 30% feel nursing will continue to offer them a secure job in the future, compared with 82% two years ago; only 38% would recommend nursing as a career, compared with 54% in 2009; and 74% of those questioned reported increased stress at work. “The survey’s findings should fire a warning shot across the bows for the Scottish government and NHS managers alike. It was a busy week for Welsh first minister Carwyn Jones. Having used his speech to the Labour party conference in Liverpool on Monday to declare the party’s victory in Wales in May shows Labour is “back in the saddle”, on Tuesday he outlined to AMs his Programme for Government (pdf). Responding, the Lib Dem leader in Wales, Kirsty Williams, declared the programme a “joke”, accusing Labour of having simply copied and pasted its election manifesto into a programme for government. Meanwhile, having obtained figures showing more than 1,000 employers across Wales had been found to have flouted national minimum wage legislation since 2002, Plaid Cymru AM, Leanne Wood, called for HM Revenue & Customs to do more to bring companies flouting the legislation to justice. “I’m pleased the HMRC and the UK Department for Business, Innovation and Skills carried out the first exercise of its kind in Wales against agencies. Sinn Fein’s education minister and acting deputy first minister, John O’Dowd, outlined plans that could potentially see the closure or merger of up to one third of all Northern Ireland’s schools as part of a shake up of the education system. DUP health minister Edwin Poots, meanwhile, suggested women who choose to have their babies delivered by Caesarean section when it would be safe to give birth normally may have to pay for it. “I am not someone who believes that the public sector has a monopoly of knowledge or a divine right to be the sole provider of public services. I am not dogmatic about how public services should be delivered, but I am absolutely insistent that we deliver the very best public services possible. Tickles me really we have had thirteen years now put behind us of a Mini Tory labour government with a leader in Blair who has made a fortune telling people how hard he had to work to get us to war, how hard he worked to pull the wool over our eyes, who did nothing for the manufacturing in this country, then you had the idiotic Brown who took for the poor to give to the rich. And Unit stood by while Labour destroyed the sick and the disabled and welfare. And this bunch of hypocrites tell us the Tories are doing the same. Jesus you lot have a nerve. If only that were true. All parties at the last election promised a referendum on the Lisbon Treaty and the excuse of coalition government stinks.